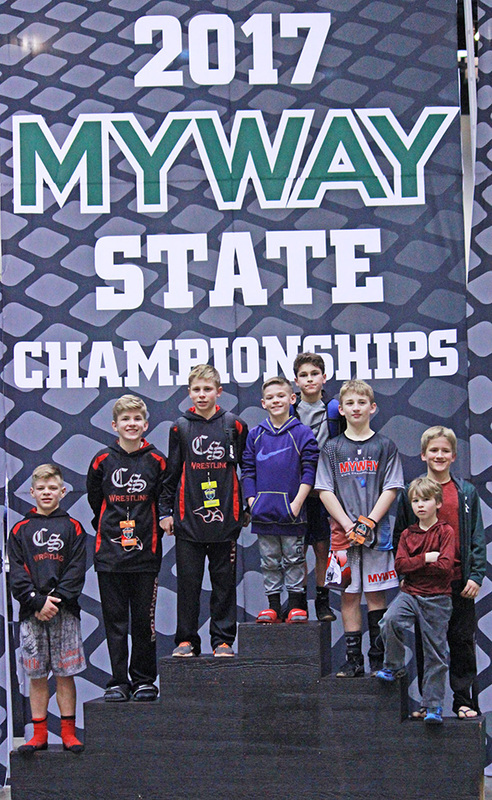 Tag Archive | "Gabe Dean"
CS Youth Wrestlers at State Finals last weekend. L-R: Carter Falan, Ben Brunner, Trevor Marsman, Blake Falan, Tommy Stevens, Logan Troupe, Gabe Gair, Cade Troupe. Photo by J. Troupe. What an exciting weekend for CS Youth wrestlers! The competition was off the charts, the Parade of Champions was exhilarating, we had great photo ops and autographs with NCAA’s Division 1 Champions Gabe Dean and Kyle Dake and in true Red Hawk fashion we cheered on the wrestlers we’ve come to know from all over the state through this great sport. Out of 301 teams and a total of 2947 wrestlers, CSYWC came in 88th in pins with 10 in 19:32, 80th in Match Points with 186 and finished the weekend 28W-25L, 167th over all. In the 2010-2012 49lb class Tucker Crystal placed 3rd after 6 matches with 3 pins in a total time of 6:11, losing one and winning two by decisions of 3-0 and 7-4. He scored 33 match points over two days. In the 2008-2009 64lb class Blake Falan wrestled 4 matches, winning his first and third matches by decisions of 5-1 and 4-0, scoring 10 match points over the course of the day. In the 2006-2007 55lb class Brandson Wood wrestled 2 matches scoring 6 match points. In the 80lb class Hudson Crystal had 5 matches with a pin in 2:36, winning his third and fourth matches by major decisions of 15-2 and 8-0 and scored 35 match points. In the 150lb class Wyatt Cooper wrestled 2 matches and scored 2 match points. In the 2005 80lb class Tommy Stevens placed 6th after 6 matches with a Tech Fall in 2:40, winning his second and third matches by decisions of 6-5 and 8-6, scoring a total of 29 match points over two days. In the 2004 105lb class Carter Falan wrestled 4 matches, had 2 pins in a total time of 4:09 and scored 15 match points. Ben Brunner wrestled 3 matches, had 1 pin in :47 and scored 2 match points. Logan Troupe wrestled 3 matches, winning his second match 6-4 and scored 8 match points for the day. In the 2003 85lb class Trevor Marsman placed 7th, wrestled 5 matches with 2 pins in a total time of 5:12, winning his fifth match by a decision of 6-2 and scored 31 match points over two days. In the 2002 95lb class Andreew VanGessel wrestled 2 matches and scored 7 match points. In the 2002-2004 Girls Division, 122lb class Ashly Erxleben wrestled 2 matches, scoring 6 match points. In the150lb class Ariana Meyers placed 2nd after 2 matches, had the fastest pin for the team with :37 and scored 2 match points.